The electronics behemoth that is Samsung sometimes works in mysterious ways — penning axiomatic smartphone slogans such as ‘designed for humans‘, for instance — but there’s very little mystery about the latest smartphone addition to its vast, sprawling Galaxy of devices. The Galaxy S II Plus is all about making the most of a winning formula by milking the 3G cash-cow of the range — aka the Galaxy S II. The Galaxy S II Plus is the Galaxy S II — but running the Jellybean flavour of Android out of the box, rather than Gingerbread. Design and internal hardware appear all but identical, judging by the spec sheets, although there is an NFC version of the S II Plus which is a new addition. But looking at the basics, the two phones are clones (something Samsung has a habit of doing): dual-core 1.2Ghz handsets packing a 4.3 inch Super AMOLED Plus display. It’s the software that’s getting the big upgrade here — with Android 4.1.2, and Samsung software additions including Popup Video, S Voice, Voice Unlock, S Beam, Direct Call, Smart Stay, Smart Alert and AllShare Play. The GALAXY S II Plus also sports a range of additional features that boost performance and the overall experience in entirely new ways. Popup Video allows a video to play anywhere on the screen in a resizable pop-up window while simultaneously running other tasks, eliminating the need to close and restart videos when checking new emails or surfing the Web. S Voice lets users control the phone using their voice; and Voice Unlock lets users unlock the phone using their own voice. Availability of the Galaxy S II Plus is unclear at this point, as Samsung could not confirm which global markets will be getting the handset — although it did say the U.K. won’t be getting the phone. So Brit S II owners will have to hope and pray for a Jellybean update. 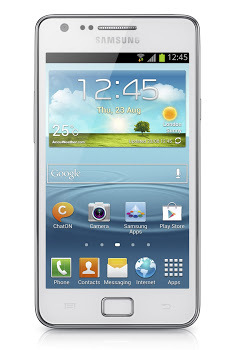 Update: Samsung says the Galaxy S II Plus will launch in Germany, before being rolled out to “other markets”. In an age of continual updates, it’s interesting to see Samsung recycling and reusing 2011 hardware. But it just underlines how, in the mobile space, it’s the software that really counts. Also noteworthy: dual-core chips are still apparently powerful enough for that next-gen software.